It only happens once or so every year that I have to review 7-inches and I have to admit that I prefer CDs because I don't have to change the record so often. 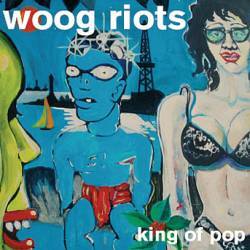 But this didn't stop me from listening to the debut by the Woog Riots, a riot pop band from Darmstadt, Germany. The A-side only contains the title song which is a nice indie pop tune with enough guitars, but also some casio pop sounds. The song is very rhythmic and has a nice chorus. The vocals are very entertaining, with a clear German accent which (certainly?) was done on purpose. The B-side starts with Fortune Teller Hotline, as lo-fi as the title track. Cool organs, a banjo and strange mixed male and female vocals are responsible for another well done song. Finally the record ends with a cover version of Adam Green's Friends Of Mine. The Woog Riots keep the spirit of the original and give the song a somewhat personal note. This 7-inch is so promising that I have to wonder why such a talented band didn't start with an entire full-length album. By the way, before releasing this EP, the Woog Riots compiled a tribute CD to Mark E. Smith.